Megan scored a goal at her last soccer game, of the Fall season. It was a very cold day, but Megan enjoyed it. Her coach gave her a patch and a medal for participating. 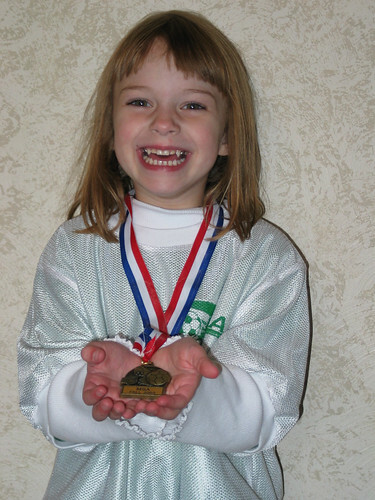 Megan was very excited about her "gold medal". Kelly made Lasagna and rolls and we took dinner to Grandpa and Grandma Freimund. We ate and then Grandma and Kelly beat Grandpa and me in Pinochle, three games to one. It was never even close. We had a great time! Grandma and Grandpa love you LOTS!